Why Don't You... Rent a Llama for Your Wedding? So you're wondering how to make your wedding day special, but you've ruled out a dance number designed to go viral, a pyrotechnic Disney princess cake and a reception brawl. Have you considered renting an animal, such as a llama? The llamas were a wedding day surprise arranged by groom Garette Ziem for his wife to be, Kim Dalton, who finds them entertaining and calming. When the two creatures appeared, she "exploded in happiness and tears," he said. "It meant so much to me that Garette went above and beyond to create this extra special moment," she said. "Llama at wedding." 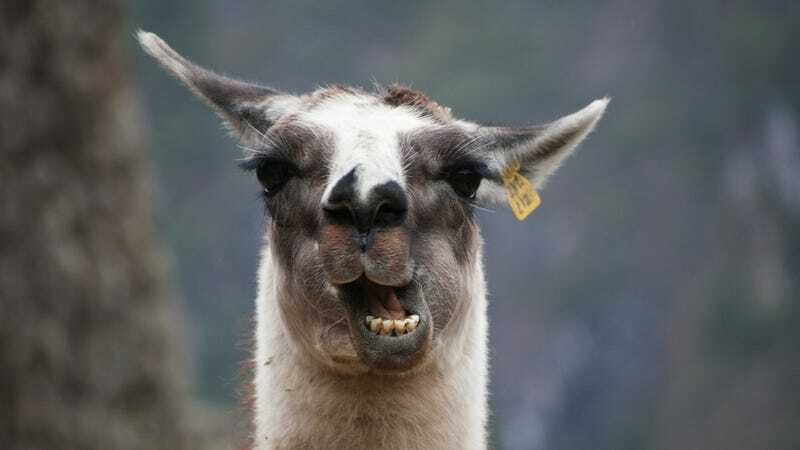 "Llama at wedding." "Llama at wedding." If you're not quite feeling up animal wrangling at the wedding itself, there's always the proposal. Would you like penguins with that? The Newport Aquarium offers a special penguin proposal package! Mr. Guthro suggested a visit to the aquarium, across the Ohio River in Newport, Ky. Near the end of their visit, he announced they would have a private encounter with a dozen African penguins.... As their tour wound down, their guide asked if they had any more questions. On cue, Mr. Guthro said he had just one. He dropped to one knee, turned to Kelly and blurted out "Marry me!" as he produced an engagement ring from a penguin-shaped box. Just be sure you're complying with any relevant local ordinances. For instance, one Kansas town requires a permit for the presence of an elephant, as well as a tranq-dart-toting handler. No word what strings come attached to the llamas.